One of the most visited natural attractions in Ireland, The Cliffs of Moher are an 8km stretch of ancient stratified rock deposits that rise up out of the sea and reach a highest point of more than 216m. Extending directly along the Atlantic coast of West Ireland’s Clare County, the Cliffs of Moher feature a number of landmarks including O’Brien’s Tower and Knockardakin, the highest point. 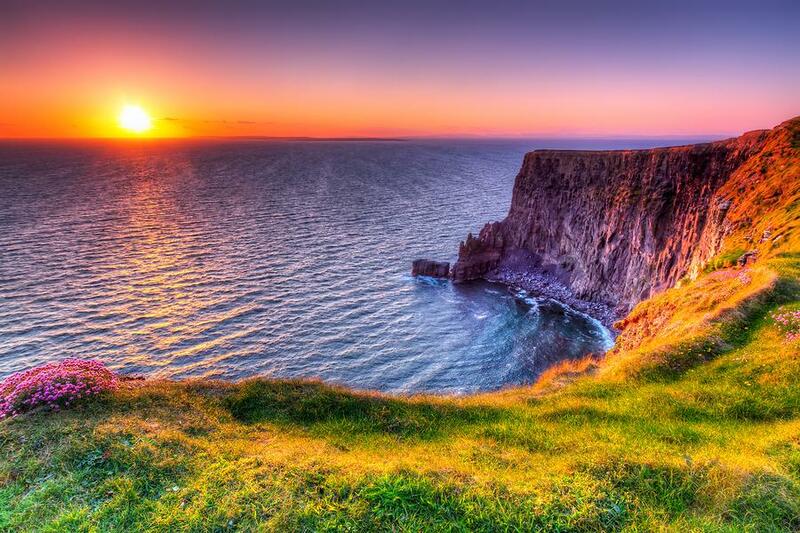 An extremely popular tourist attraction thanks to its amazing vistas, the Cliffs of Moher offer spectacular views of the Kerry and Connemara mountains, Aran Islands and Loop Head lighthouse on a clear day. The Cliffs of Moher take their name from the Gaelic word Mothar which means ‘ruined fort’ as Moher tower has now replaced a 1st century fort that once stood in the same location. As such the Cliffs of Moher translates to the ‘cliffs of the ruined fort’ and although no physical trace of this 2000 year old fort exists, the Cliffs remain a living testament and are visited by nearly one million visitors each year. Part of the Cliffs, Hags Head is a rocky headland situated at the southern end and takes its name from its resemblance to a woman sitting down when gazed upon from the north. 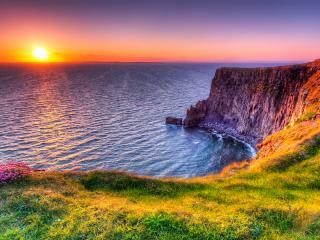 With such a rich and ancient history, it’s no surprise that these cliffs are the stuff of legends. In fact, mankind has passed down stories about these mighty layers of rock for centuries, seeing them become an integral part of the myth, magic and mystery that surrounds many of Ireland’s ancient natural attractions. More recently the cliffs have been used to the advantage of the people, playing the part of a lookout and offering fish, eggs and feathers for use. Although they’ve had their practical uses, there’s no denying that in the last hundred years the Cliffs of Moher have primarily served as an important tourist destination that has gained great importance in the heart of the Irish and their visitors.